House Speaker Michael Busch introduces legislative Democrats' priorities for the 2019 General Assembly session. To that end, at the top of Democrats’ list is a $15 minimum wage, something that has been unsuccessful in Annapolis for several years but has until now lacked leaders’ full support. “Folks, its time has come,” Prince George’s County Del. Dereck Davis said of the bill. Davis leads the House Economic Matters Committee, which is scheduled to hear the bill next week. Democrats are also backing the creation of a watchdog to review prescription drug prices and keep costs down. And they plan to increase the child care tax credit, something Senate Finance Committee Chairwoman Delores Kelley, who represents part of Baltimore County, said hasn’t been updated in 20 years. “If we’re trying to worry about wages for working families and middle class families, it won’t do any good if just to have the kids properly cared for takes almost everything the family has,” Kelley said. She said Maryland’s child care prices are among the highest in the country. On non-economic issues, one of Democrats’ top priorities is banning 3-D printed guns and “ghost guns,” said House Majority Leader Kathleen Dumais, from Montgomery County. 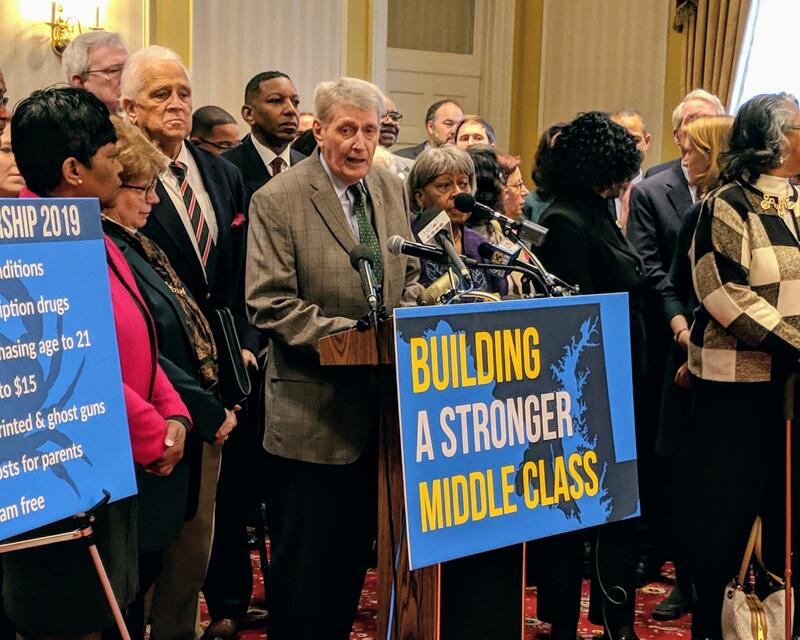 Among health-related priorities, the Democratic leadership is backing a major priority of the Maryland Legislative Black Caucus: raising the legal age to buy cigarettes to 21. Davis said the data speak for itself: 7,500 adults die each year in Maryland as a result of smoking cigarettes, and 1,900 minors become addicted to smoking each year. Of those adult smokers, 95 percent began smoking before they were 21 years old. In environmental priorities, Democrats are supporting a statewide Styrofoam ban. Several jurisdictions around the state, including Baltimore City, already ban the material. Democrats also said they will seek more money for public schools and health insurance coverage protections for people with pre-existing conditions. Senate President Mike Miller is being treated for prostate cancer. As the 76-year-old legislator made his diagnosis public on Thursday, he promised that he will continue overseeing the state Senate while undergoing chemotherapy during the General Assembly session that began on Wednesday.